What we have here is one of those serendipitous moments that make life so interesting. My brother sent me an email a few weeks ago with a link to this recipe for braised green beans at Slate.com. I clicked on the link and took a quick look. 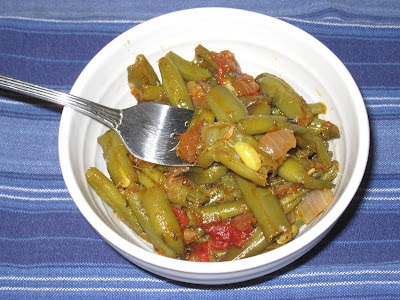 Ok, braised green beans, nothing new but seems interesting enough, maybe someday I'll give it a try. About an hour later I headed over to Treasure Island and the first thing I saw when I walked in the door was a big beautiful pile of locally grown fresh picked green beans on sale. That's right, on sale. It seemed like fate to me - I had to make that recipe. Which I did the next day. I didn't havefresh dill so I used dried thyme, and I cut both the oil and the water in half. As the recipe directed, I threw everything into the pot, covered it, turned the heat on to medium-low, and let it cook for a couple of hours. The end result? Oh, my. Yep, that's literally what I said after I took the first bite. Oh, my, indeed. They were spectacular. Transcendent. Concentrated green bean flavor with a smooth, velvety feel and a tart finish provided by the lemon juice and tomato. That was about a month ago. I have since made them three more times. I used fresh dill the next time I made them, and guess what: I liked the thyme better. I garnished them with yogurt and they were delicious that way, too. Most recently, I served them over brown rice and they made for an incredicly tasty meal. My brother was hoping my sister-in-law or my niece might feel inspired to make them down in Austin. He's a good cook, but not much of a recipe follower. I don't think he has had the good fortune to have tasted them yet. I belIeve I will take pity on him and make them when I am home for the holidays. It's the least I can do for the poor soul. I mean, it's not like I'll be jonesing for them or anything . . . This delectable treat can be served with just about anything. My next batch will be the perfect companion to the season's first chicken and dumplings. Combine the beans, onions, garlic and tomato in a medium-sized saucepan. Sprinkle the thyme over the beans, crushing the leaves between your fingeres to release the oils, and then season to taste with the salt and pepper. Add the lemon juice, oil and water. Cover the pan and cook over medium-low heat until the beans are falling-apart tender, about two hours. Adjust for seasoning. Serve over brown rice, garnished with the yogurt if desired.